I catch myself pretty much every day wondering how it is possible to go from feeling crappy to feeling happy to feeling annoyed to feeling peaceful to feeling restless to feeling excited to feeling unsure to feeling sure – all that within the course of one single day. I haven’t found the answer yet. Split personality? I hope not. Insecurity? Maybe. Or probably I am simply overwhelmed by the amount and variety of impressions and experiences I have here every day (it reminds me a bit on the Yo-Yo’s I used to play with when I was a kid). They are so different from the familiar ones at home that they generate tornadoes inside of me. Good tornadoes though. These tornadoes allow me to feel alive. They broaden my horizon and make me appreciate how many amazing things I see, feel and think about here every day. Don’t get me wrong. It is not all a bed of roses. There are plenty of situations where I just feel like screaming – asking myself the deadly question “penyang?” (why?). But in the end of the day when I lie in my bed, staring at the center of my mosquito net, I always (really always) come to the same conclusion: I am happy that I am doing what I am doing and I don’t regret my moving to Laos a single day. Here are some of my great and not-so-great experiences, thoughts and impressions that create those tornadoes. I have been suffering from severe back pain over the last months, a well known phenomenon to me, only that in Austria I go to my beloved Chiropractor who cracks everything back into place and here the word chiropractor is as unknown as the profession itself. The medical care here in this country is very bad. It is scary to see and hear from the locals I talk to how poor the medical supply is and how many people die of sicknesses that would easily be diagnosed and cured in more developed countries. As there is so often a good side to every bad side I started to do Yoga to reduce my level of back pain. I had practiced Yoga many years ago in Austria but had stopped due to my back problems. Now I picked it up – particularly to antagonize my pain. Not only am I extremely lucky to have the best teacher that I could have, she also brings me to experience a very special state of relaxation and contentedness. Luang Prabang has a big Yoga community and being surrounded by so many wonderful Yoga teachers brings me closer to learning about meditation and other valuable exercises to better my health. We have reached low season (=rainy season) now and as nice as it is on the one hand to wander through quiet empty streets it is a pain on the other hand to stay motivated and to motivate the hotel staff when there are hardly any guests. 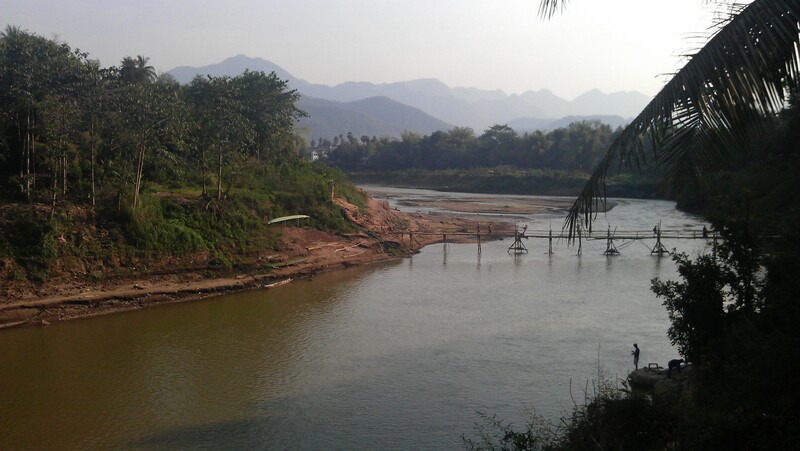 I love the 10-minute phenomenon in Luang Prabang. Everything is 10 minutes away. No matter if you walk, go by bike, motorbike or Tuk Tuk. It seems to always work out that you reach your target in 10 minutes. In my last job in Austria I had to commute 1 hour each way in the worst traffic jams and I promised myself that I didn’t want that anymore as this was a huge loss in quality of life. And here we go: now I have 10 minutes max. and instead of seeing idiots in their cars honking their horns and showing each other the finger I see the Mekong, blooming trees, some people walking by slowly and very often friends or some of my students who give me a big smile while I drive or walk past them. And while I am already talking about nature and surroundings: there are not too many places where you can promenade in the middle of the street after 8 pm (no cars, no bikes, no nothing! ), gazing at the stars, listening to crickets and geckos and enjoying the reflection of the golden roofs of the temples which line the many streets of Luang Prabang. I am still keen on learning the Lao language much better than I do up to now. Some days I feel like I am finally getting a bit of a grip on it, other days I am the queen of playing charade again (acting and gesturing in front of street vendors or the guy who should fix my roof and trying to get my point across) as I can’t remember the vocabulary I had studied the week before. But I have a great Lao teacher who is very patient and fun so I am enthused every time I leave from the lesson. 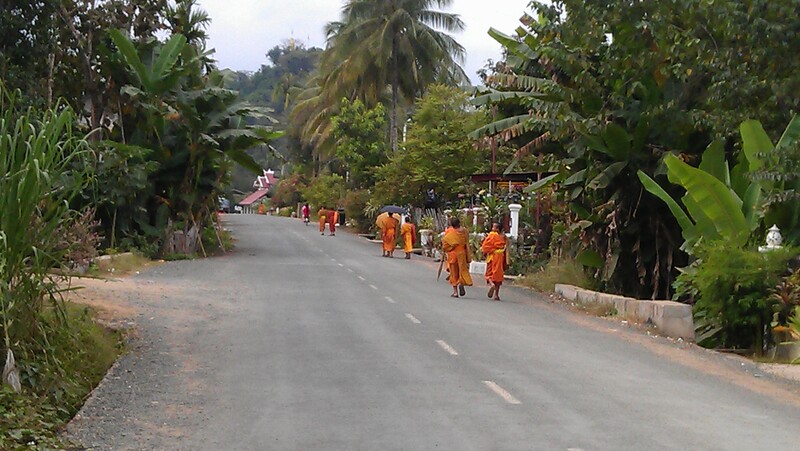 Everything here in Lao is slooow speed and sometimes I notice how terribly well my brain adapted to this slowness. Studying this new language is the best way for me to keep my brain active. And besides I have always enjoyed studying languages and learning an Asian language is particularly intriguing. The thing I am probably struggling the most with is the passive and reactive work mentality I encounter day by day. It is such a contrast to what I grew up with that it sometimes really makes me want to go ballistic. I know that the Western work attitude is probably often the other extreme – work til you drop dead – and therefore I believe that the truth lies somewhere between what I experienced at home and what I see here. but finding this balance seems to be one of the trickiest things in the world. 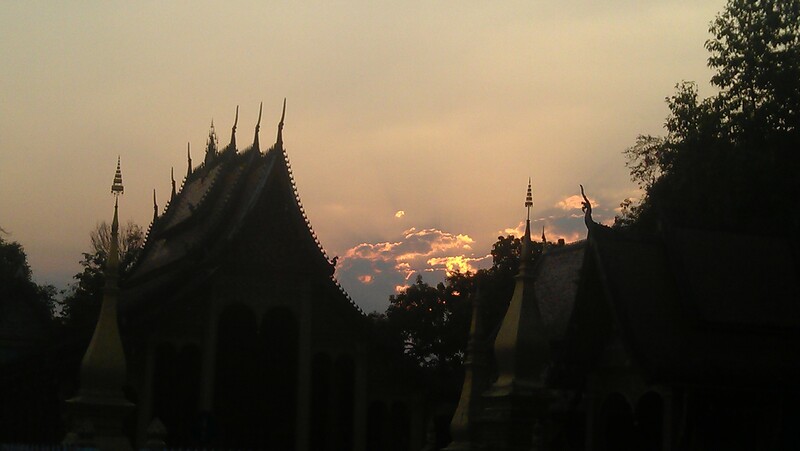 Teaching English in temples was the main reason why I had come back to Laos after my first visit here last summer. It had given me so much pleasure and fulfillment in the first few months but after about 5 months I had my first crisis as I felt that I was making no headway. Especially my young students were very lazy and I saw no improvement which started to frustrate and upset me. I had a hard time handling this situation as they mean so much to me as individuals but at the same time I was demotivated because I felt as if I was wasting my time and could use it better with students who really want to make an effort and learn. It was a very hard decision and still makes me sad but I figured it is better to focus on those older students who show more commitment and stop teaching the little ones. At the same time I started teaching in 2 other temples. One is around the corner from where I live. In my opinion the most beautiful temple in LP and while I was on one of my night-time walks I literally stumbled upon an English lesson which one of the novices held for his other fellow novices. First I started off teaching a whole bunch of novices but very soon it turned out that 9 out of 10 weren’t really too ambitious. But there is one novice, a shy 17 year old boy who has a wonderful personality and who truly wants to learn this language. I appreciate and respect him very much and although I don’t know much about him I know that he is special and therefore I decided to give him private lessons. He told me he will finish school in 2 years and then wants to work in a hotel. He asked me if I think that he would get a job. My aim is to get his English to a state which will enable him to get a job when he finishes. The thought of that is satisfying. The 4 new young gentlemen in my life whom I am spending all my evenings with at the moment are quite extraordinary: 4 novices aged between 15 and 18 have a great sense of humor and we end up chatting about the most diverse topics after class. I am so content and happy when I leave the temple, having had a good English lesson and nice conversations with young guys who are interested and keen on interacting with people from the “outside” world. They also have a very – unique- cat which whizzes around the classroom every evening and seems to think that I am very keen on its presents. Yesterday she dropped a dead lizzard on my handbag, today I got a dead bird as a present and at the end of the class she tried to park a half-dead cockraoch in my handbag. I wonder what’s next tomorrow. Maybe a dead pig or a buffalo. Living in such a small town makes it easy to getting to know a big part of the expat community. And the people who live here are great. I would say that the common denominator of those people is that they all are social individuals who have a strong personality, the most diverse backgrounds and that they enjoy life, being healthy, active and party (with or without a reason). Oh, and they are there for you, no matter what you need, you can count on someone helping you. At home one often tends to surround oneself with people with similar backgrounds, hobbies and maybe even aims in life. But here it is a potpourri of characters who decided for whatever reason to swap life in big, busy, stressful cities with living in sleepy and laid back Luang Prabang and this makes it very fun, stimulating and enjoyable to be around people whom you would probably not get to know in your “normal” life at home. I count myself very lucky to be surrounded by those people. I am living in a house. A house with character (always sounds good). Having lived all my life in a modern apartment this is quite a contrast to my new home. Sometimes I curse it (especially when I discover a new leak or have too many 4-legged uninvited visitors around) but for the most time I love it. I have 2 hammocks, spend most of my time on my balcony or terrace, I am 100 meters away from the Mekong and 100 meters sway from the Nam Khan river and my views are some of the most beautiful temples in town. Oh, and the best noodle soup place is also just around the block. Pretty much the perfect place. I am sure there are many more things that contribute to the way I feel here. I am sure this list will grow. And grow. Posted by Brita Graser on 27. June 2013 in Allgemein.